TRIUMF accelerators are the heart of the Canadian accelerator-based experimental subatomic physics program, both because they enable on-site world-class research in nuclear physics and because TRIUMF’s expertise allows Canada to make significant in-kind contributions to off-site international accelerator projects thus enabling participation in experiments at those facilities. In addition, the TRIUMF accelerator complex is the basis for high-impact Canadian research in materials science and PET-based nuclear medicine programs. Finally, we envision expansion of programs designed to utilize the accelerator infrastructure and expertise as a training ground for the next generation of accelerator scientists and engineers. A major aim of this expansion is to establish a strong graduate student program in accelerator physics in collaboration with member universities, from the University of British Columbia to the University of Toronto. The TRIUMF cyclotron offers the highest power on-line separated isotope beam (ISOL) driver in the world giving the ISAC facility the world lead in the production of many exotic ion beams particularly on the neutron-deficient side. These beams offer a major advance in probing nuclear physics processes and uniquely place TRIUMF as a leader in experiments at the “precision frontier” to address some of the fundamental scientific questions of our time. While TRIUMF does not support on-site subatomic physics research at the “energy frontier,” its accelerator scientists contribute significantly to projects around the world, and thus provide a mechanism by which Canadian scientists participate in international experiments such as ATLAS at CERN, T2K at JPARC, and possibly the International Linear Collider (ILC) and CERN Large Hadron Collider (LHC) upgrades. TRIUMF accelerators also enable a research program in materials, bulk and surface effects in extreme conditions, as well as a world-renowned nuclear medicine program that utilizes medical isotopes combined with positron emission tomography detectors. TRIUMF has a clear vision of how to enhance the base for Canadian accelerator science and technology human capital. We plan to strengthen our ties to the university community, primarily within BC, but extending as far as Ontario, and to set up an accelerator physics program with TRIUMF staff teaching courses and mentoring students towards advanced degrees. These education and mentorship opportunities will build up on the already successful Co-operative Education Program that involves tens of undergraduate students a year, who gain practical knowledge in the field of accelerator engineering at TRIUMF. The accelerator physics research team ensures that the beams required to satisfy the demands of the TRIUMF science program are delivered. 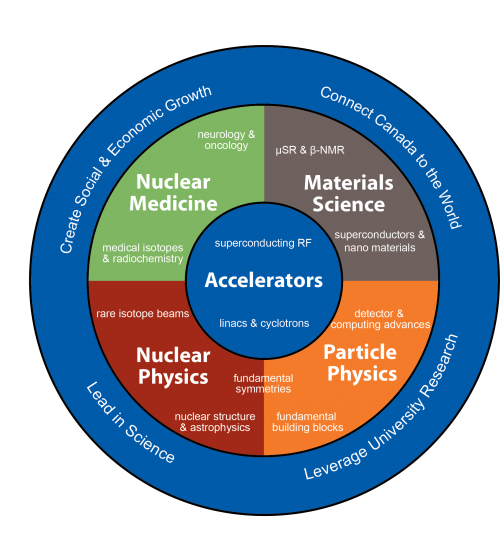 The priorities of the group can be divided into three broad classes: (1) support for operation and development of TRIUMF accelerators and beam lines: (2) support for approved collaborations with other accelerator based laboratories: and, (3) research in theoretical aspects of accelerator physics. One important activity not captured in this section is the ongoing support for operation. This support includes help with tuning accelerators, beam lines and the ISAC mass separator, development of software to facilitate tuning by operations, and training operators to understand and operate beam line and accelerator components.